We travel for lots of reasons, but a lot of those reasons are food. 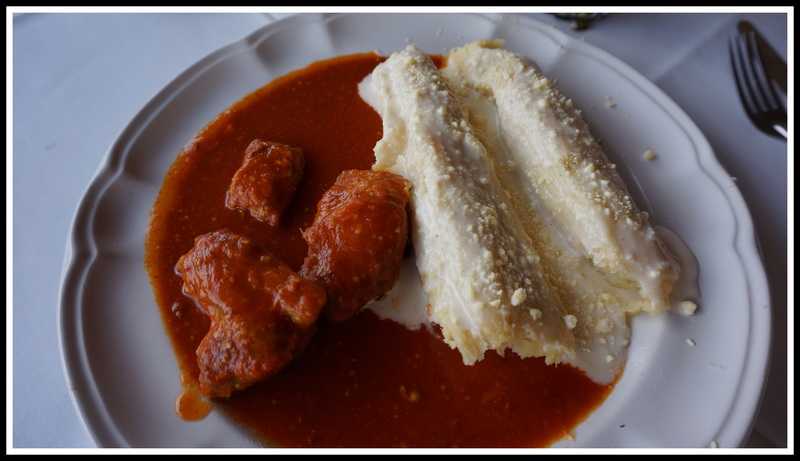 Here are a few of our highlights in the Michoacan and Guerrero States area that are food related …… WARNING – you will either be hungry or booking flights to Mexico! Whenever possible, if we are eating out for breakfast- this is it. 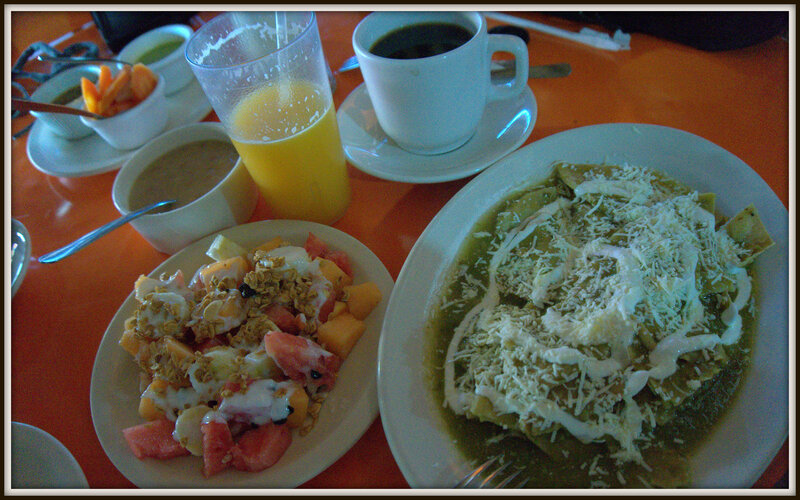 Chilaquilles solo, in other words no chicken or eggs, beans, fruit with yogurt and granola, fresh squeezed orange juice and coffee. Doesn’t get much better than this! p.s. I have discovered that it isn’t “beans” I dislike … it is kidney beans! Have you ever seen such cute little red potatoes? 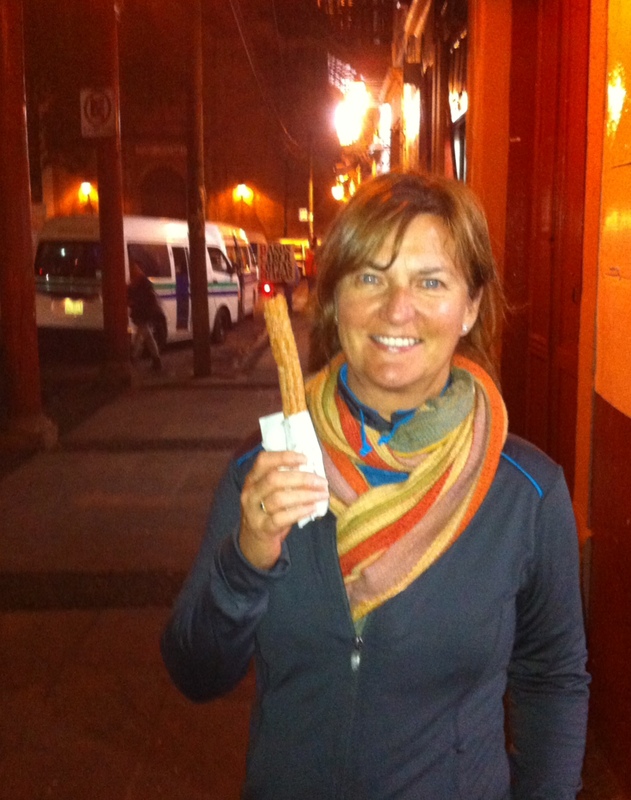 Churros! Eating at least 1 a day keeps everybody happy. 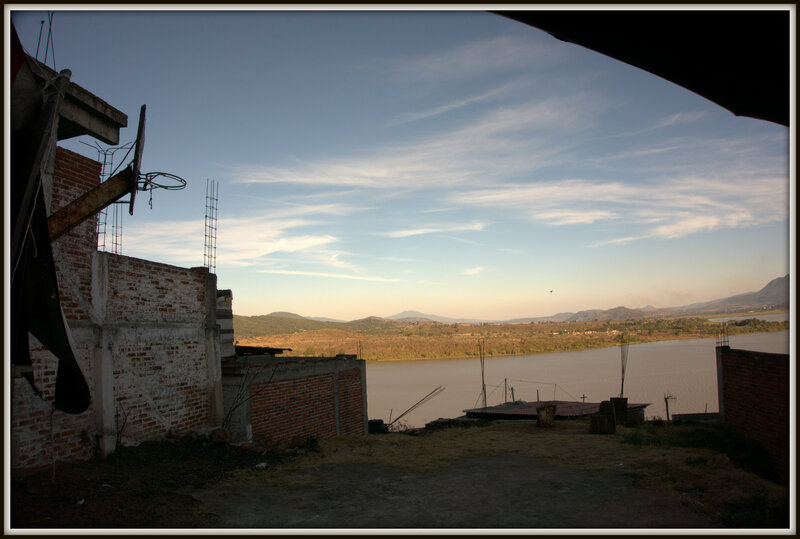 I honestly think the best ones are found in Patzcuaro. 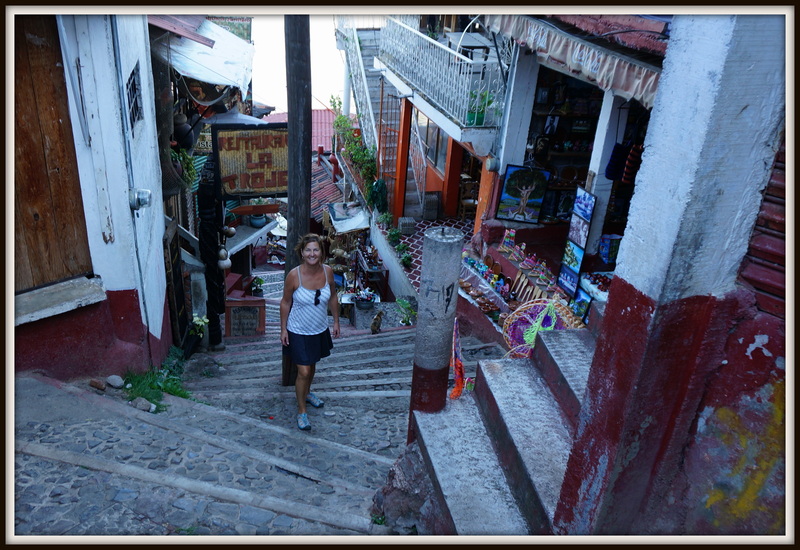 We walked for ages trying to find this place in Patzcuaro – mainly because we took a few wrong turns. 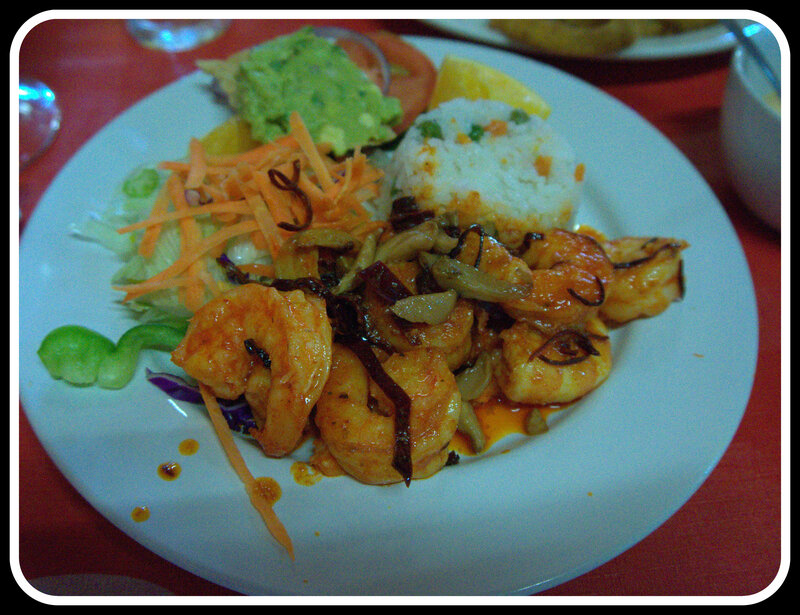 Camerones cooked with guajillo chiles and garlic at Mariscos La Guera – so delicious. 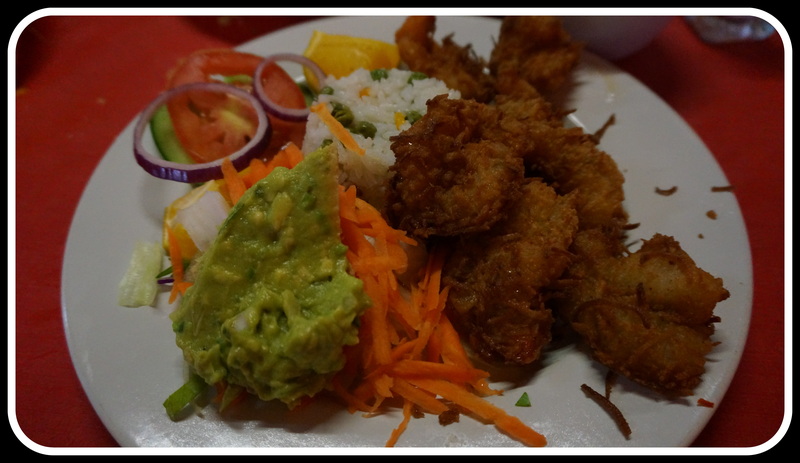 Camerones al la Coco – I think the best coconut shrimp we tried. Lightly coated in coconut and such fresh shrimp. 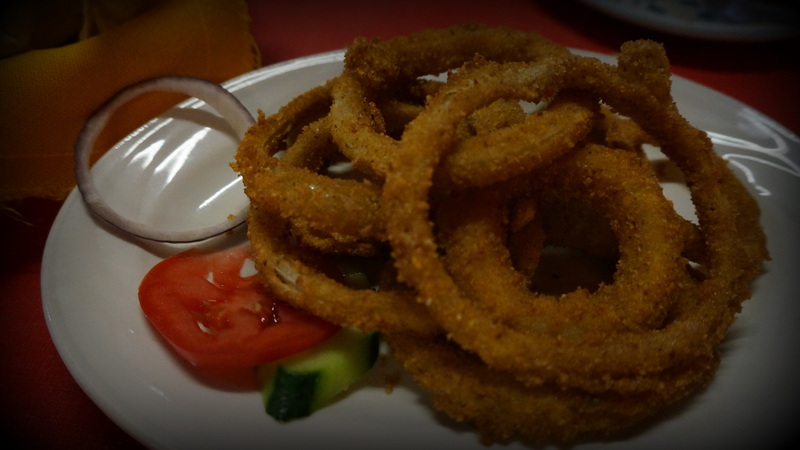 First time we have ever seen onion rings on a Mexican menu – given that onions are so delicious here we gave them a try and it was worth it. 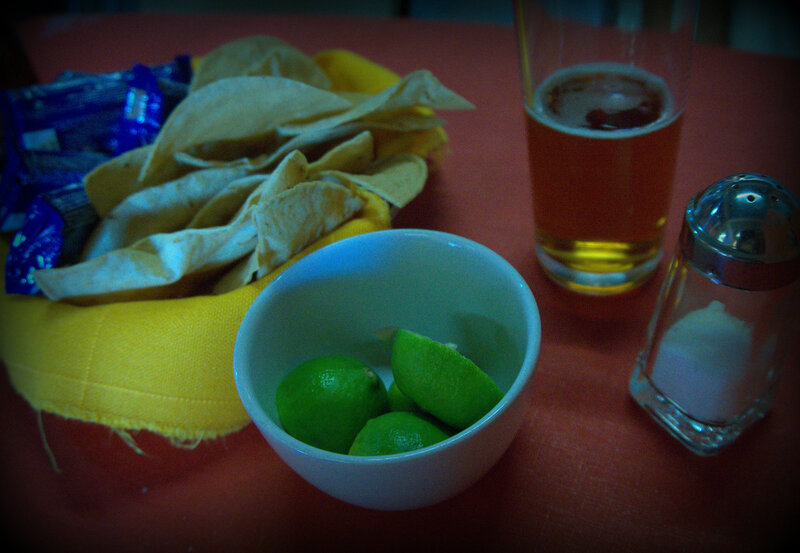 Pretty much every time you sit at a restaurant in Mexico you will receive some version of this … chips, lime, salt and various salsas. Now, not saying that Sabrita and Lays don’t make awesome lime chips, but these fresh chips, with lime, salt and chile if you want it drizzled over top are the bomb. Nothing beats them. 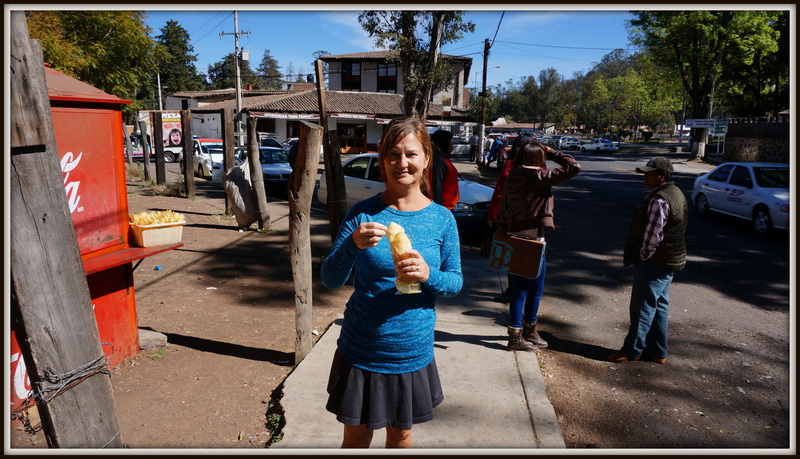 The Michoacan version of tortilla soup is indeed different, and we found a delicious version at Lupitas in Patzcuaro. 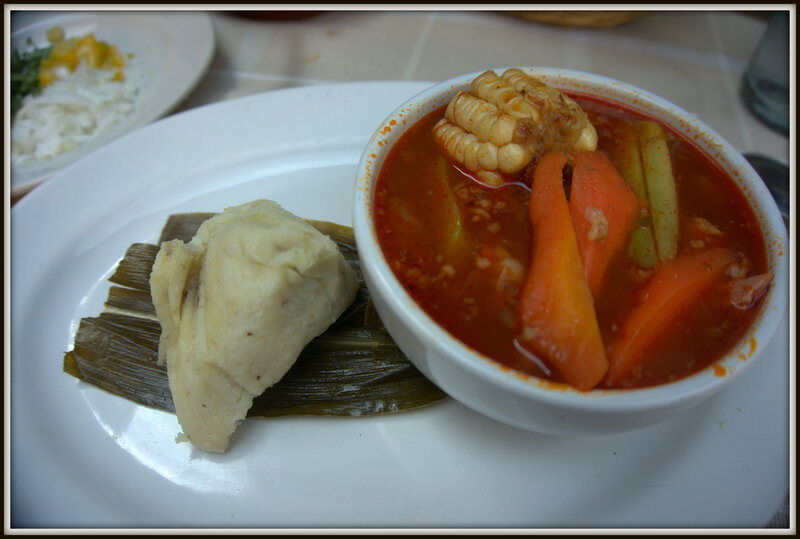 This beef based soup arrived loaded with vegetables and served with a small tamale. It was so good I wish I could remember what it was called. 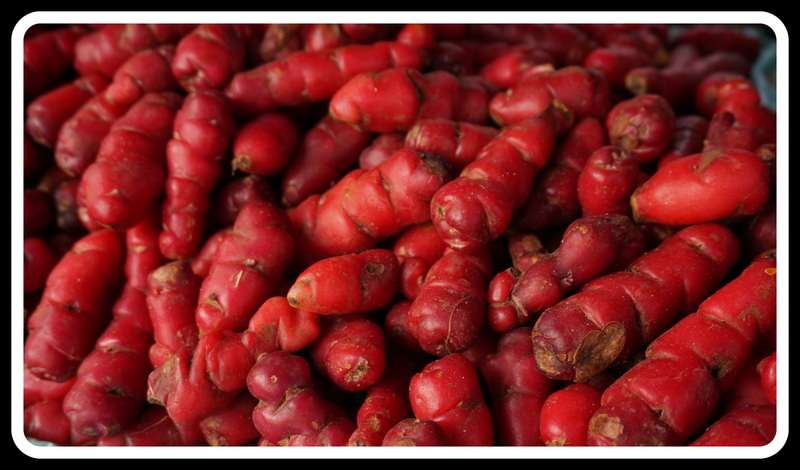 Markets are full of amazing ingredients, make sure you shop here whenever you have the chance. 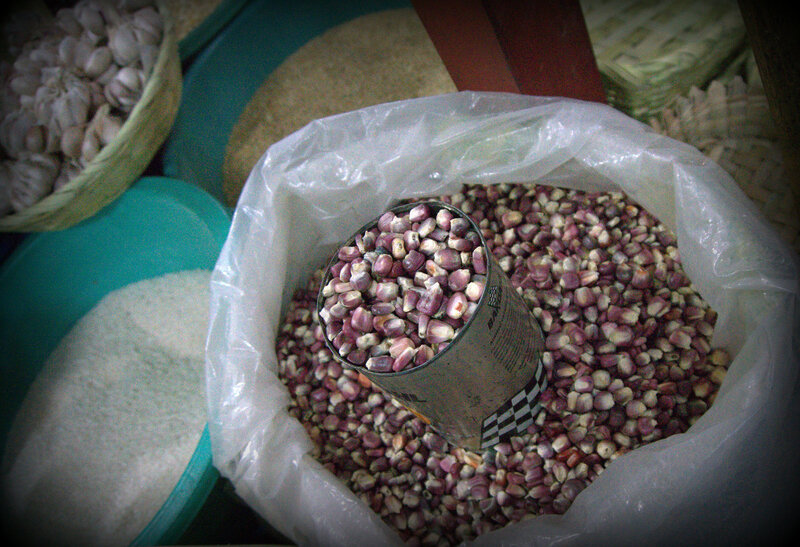 Here is dried red corn, ready for use. 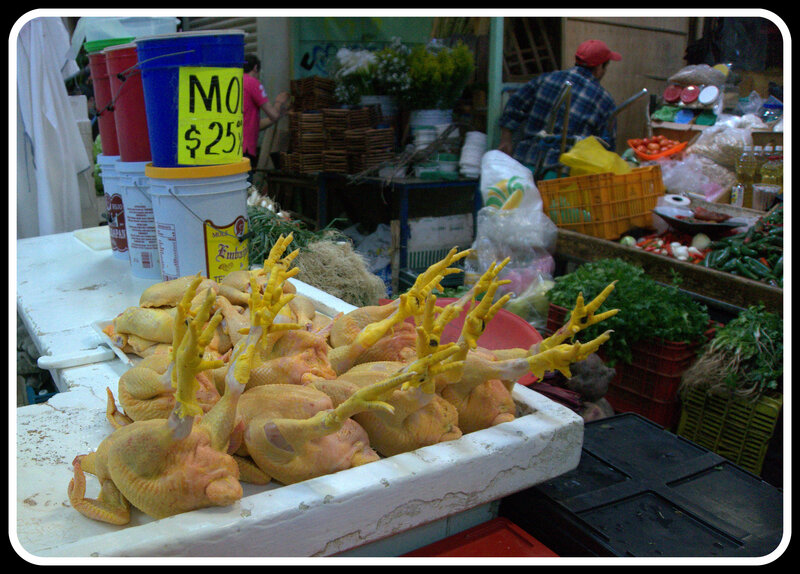 Fresh chicken is everywhere, usually with a yellow tint. They feed them marigolds for that vivid colour. You can have it as it, or they will chop it however you like – including trimming the nails. 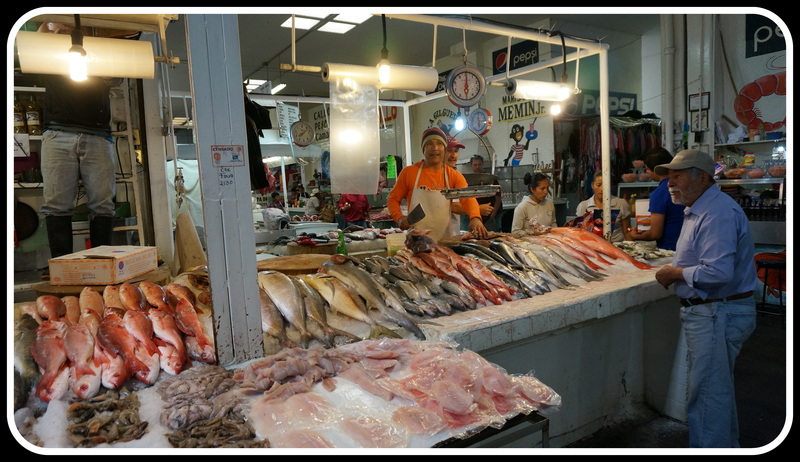 Right beside the chicken, you can pick out your favourite fish – again, they will prep it any way you like. Go early in the day for the best, freshest selection, but don’t be afraid to go. 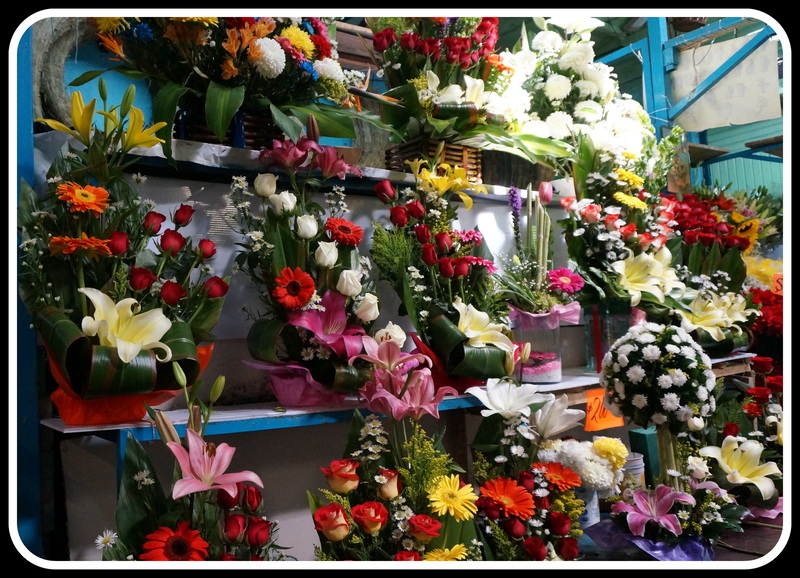 Just to confuse your nose a bit, these gorgeous flowers are right across from the fish and chicken……..
Gazpacho in Morelia is a bit different than what I was expecting, no tomato soup here. This truly amazing and refreshing dish is finely diced fruit topped up with lime and orange juices, chiles, salt and cheese. 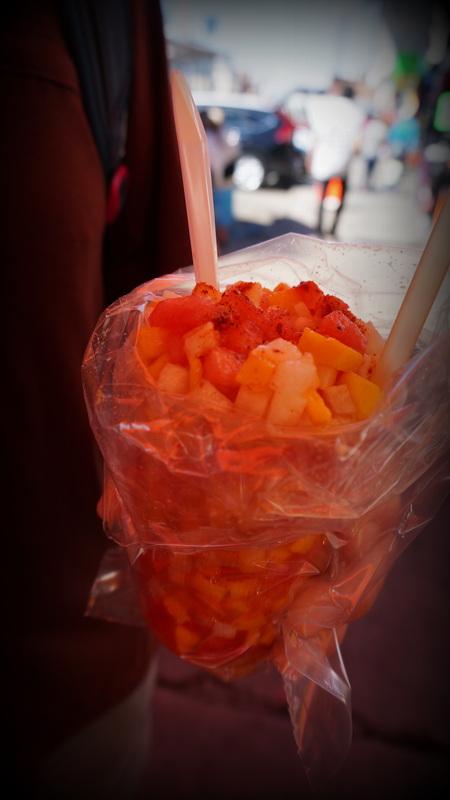 The plastic cups are filled with an endless variety of minced fruits and vegetables. We chose melon, jicama and mango and skipped the cheese. 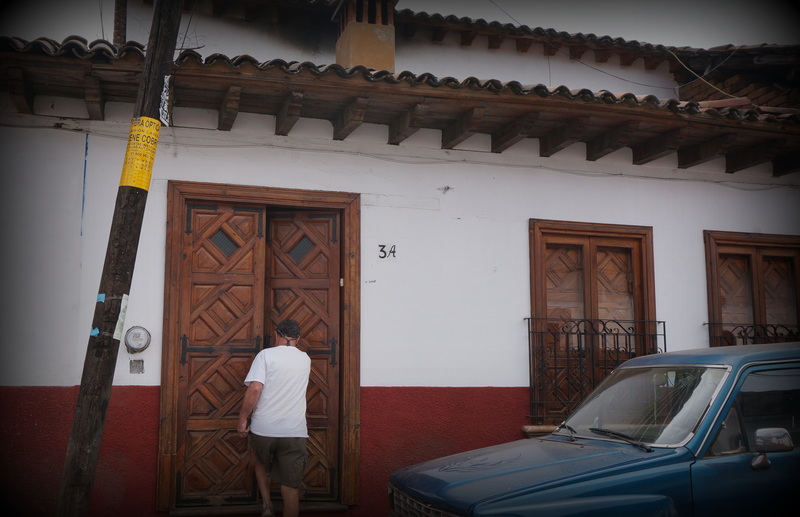 We came back to stay in Uruapan another night, primarily to go to La Mesa de Blanca – a restaurant we had heard about from many sources, and most primarily from “Mexico Cooks!” and “My Mexican Kitchen” … both proven reliable sources. This restaurant is incredible – up a dusty little road in yet another tiny Mexican village, Ziracueretiro. 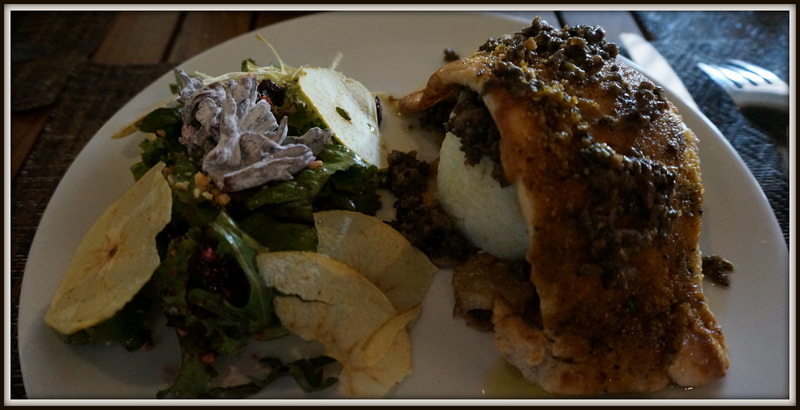 The food was amazing (I know, you’ve heard me say that before …) but it truly was. 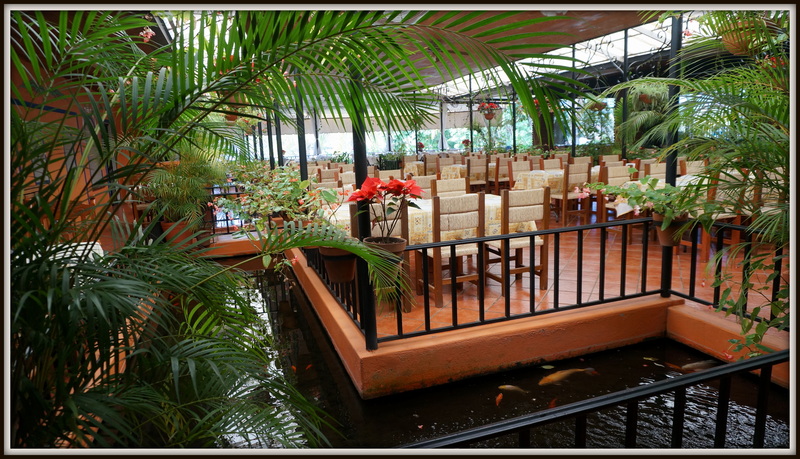 This beautiful restaurant fills up in no time – only open Thurs – Sunday. We got there ahead of the crowd, just as they were preparing to open. Grant’s chile relleno was the best ever. 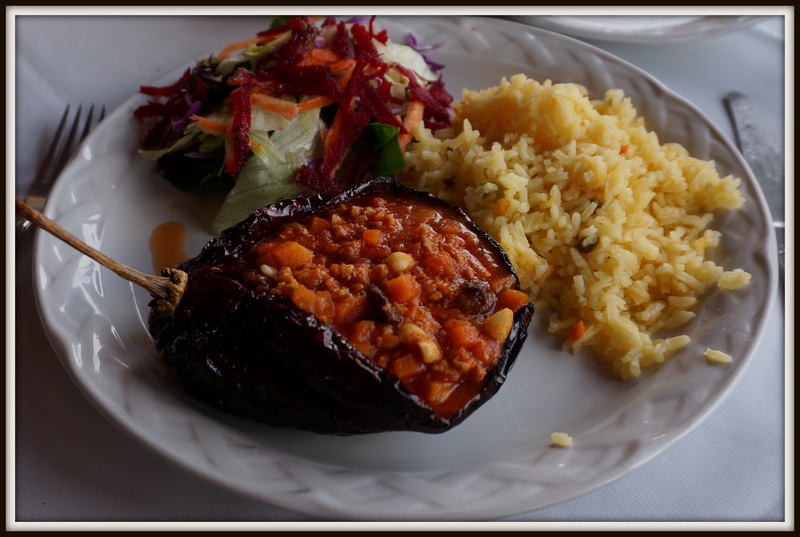 Filled with a Mexican version of chile that was outrageously flavourful. 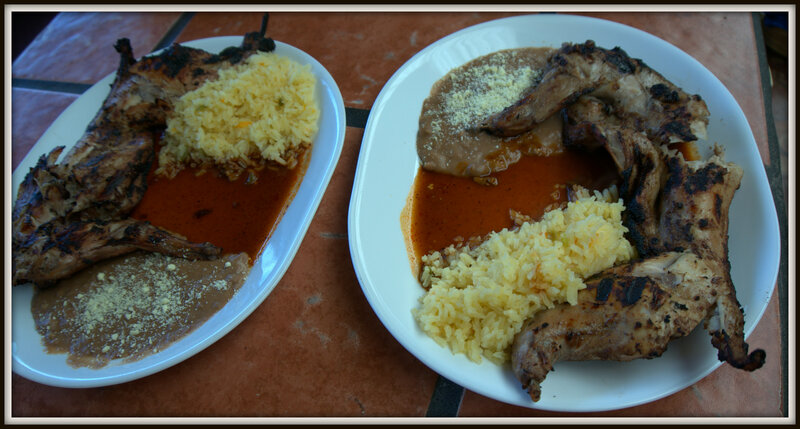 On a valued recommendation, I went with Huchepos con costilla y credo. These “tamale like” creations are lighter and fluffier than a tamale, and those little pork rib lets were fantastic. No, we didn’t also order conejo (rabbit) but this grilled conejo just looked too good to not get a photo! 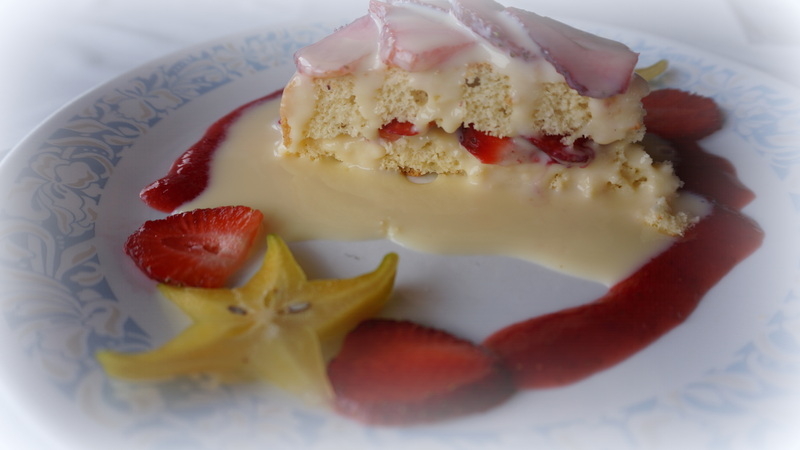 Totally unusual for us, but we ordered this yummy strawberry volcano and it was well worth it. 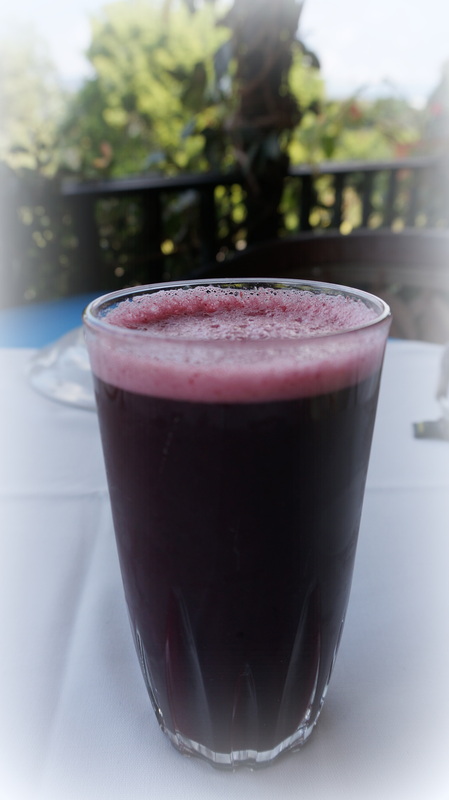 Famous for their fruit water, this zarzamora fresco (blackberry) was so refreshing. I’m not sure why we don’t cook pork shank as often as we do lamb shank at home, but after trying it in Mexico we sure will now. 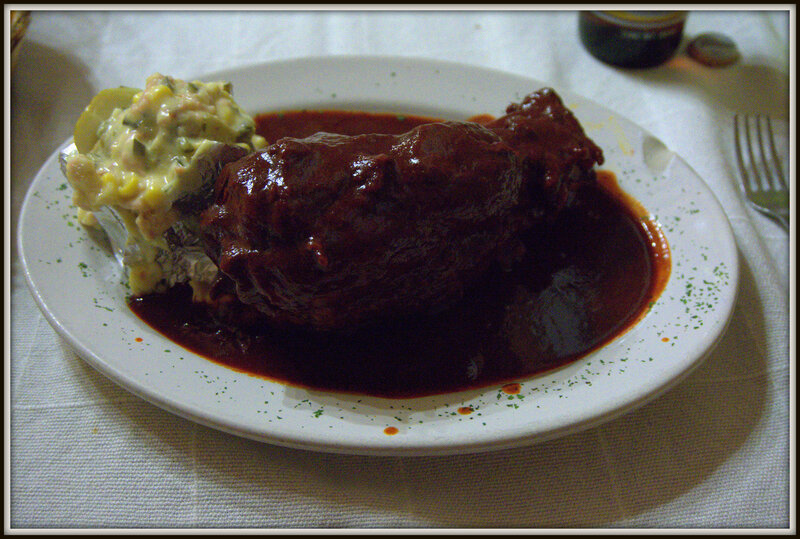 Chamorro Adobado in Patzcuaro – pork shank in adobe sauce. 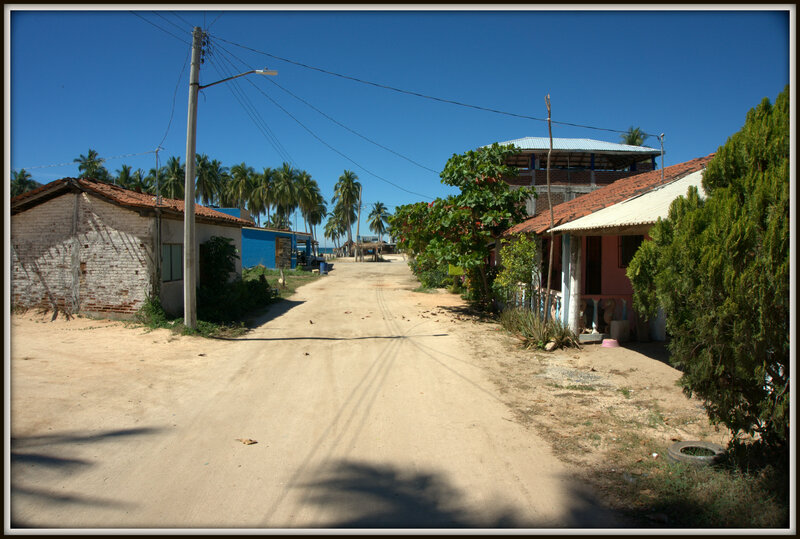 Back in Barra de Potosi for a few days, and fortunate enough to stay with Eugen and Rita at Villas Tuparaiso – definitely our new friends. Their villas were full, but they have 2 rooms at their home which we were very happy to share with them. 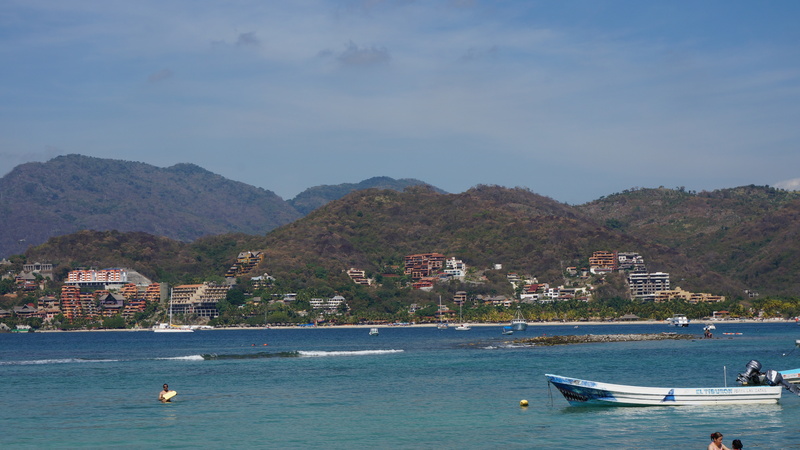 Such warm, welcoming hosts go a long way towards creating a great place to spend some time to relax, enjoy the beach and generally live a little bit of Mexican life. 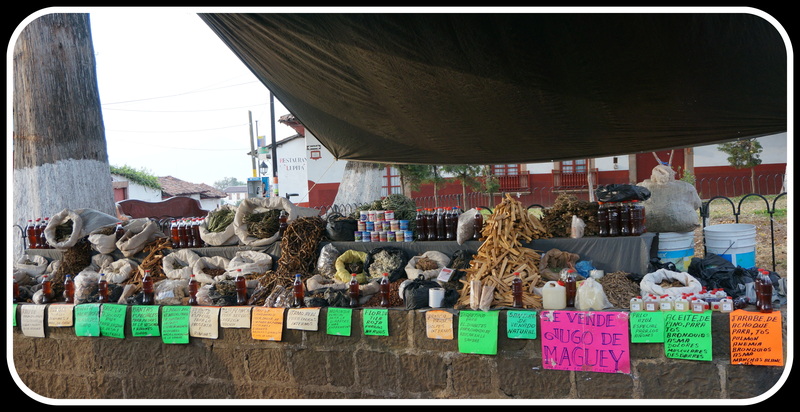 One amazing reason for cooking yourself in Mexico is the abundance of fabulous ingredients. These shrimp cost 90 pesos for 1/2 a kilo – cleaned and ready to go. Camerones con cebolla y ajo …. 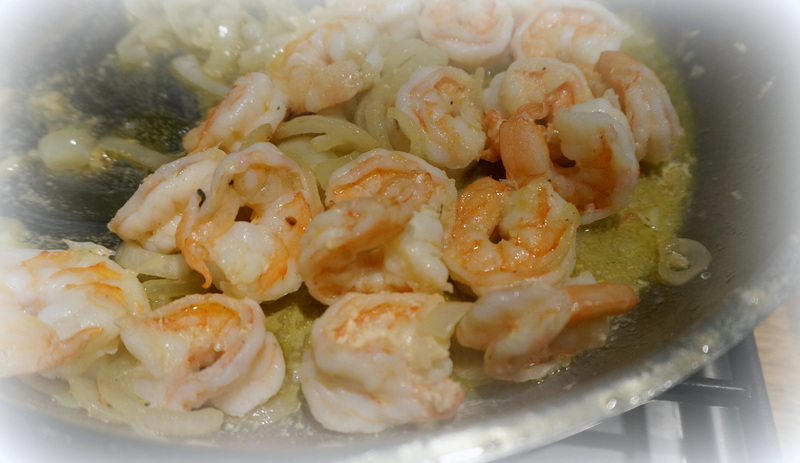 or shrimp with onions and garlic. When you start with something so fresh, you just know it will be delicious. 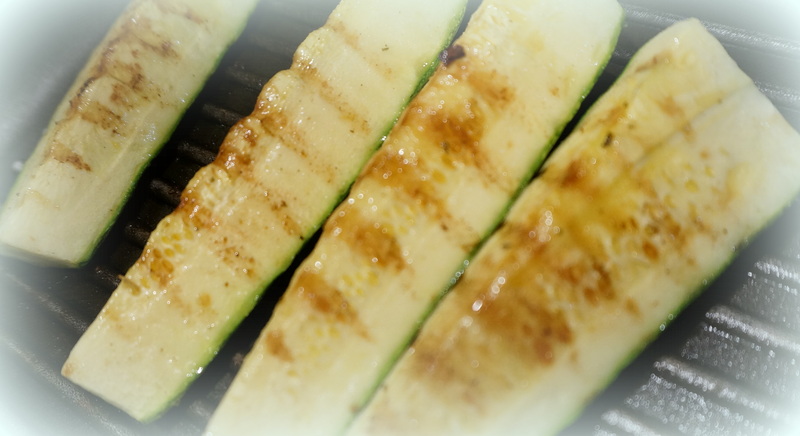 Add those shrimp to some grilled zucchini and the meal is perfecto! Should you have an opportunity to use one of these mocaljetes to create your salad dressing. or sauce of any kind – go for it! Or … grill up some tomatoes, habanero pepper, onions and garlic. 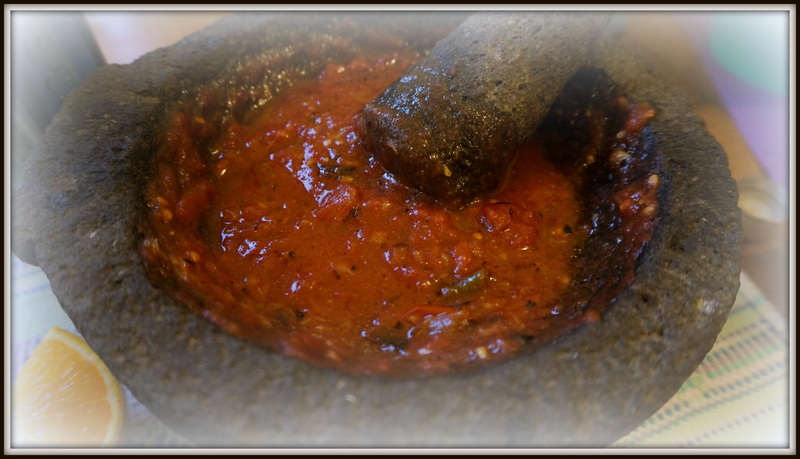 Use this to crush it into a salsa or sauce and pour it over grilled veg and pasta. Surf behind me … perfect pool to float in after riding the bikes for 30 minutes to this beautiful little spot. All along Playa Blanca you will find little spots like this to rest, swing in the hammock or float in the pool with the waves crashing on the beach. If you are looking for more people …. 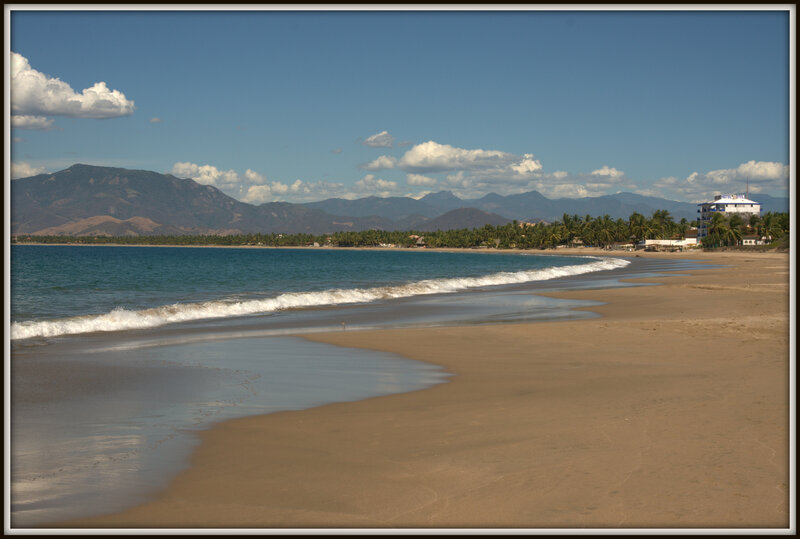 just go to the centre of it all in Barra de Potosi – lots of palapa restaurants there – especially busy on long weekends with Nationals hitting the beach. 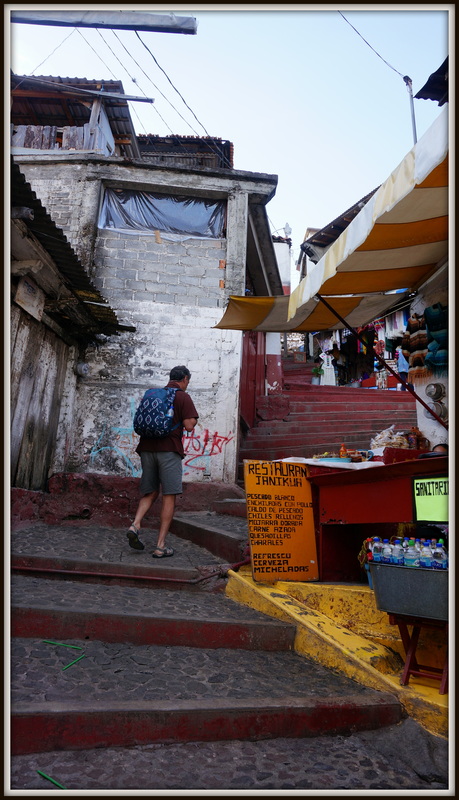 From Villas Tuparaiso we would walk the main drag to pick up vegetables, fresh seafood or chicken …. pretty easy to find anything you want within this little stretch. Miles of white sandy beach at Playa Blanca. 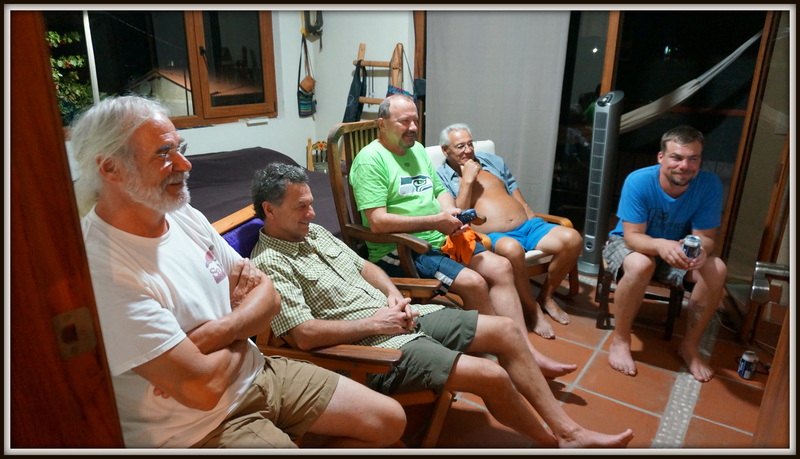 Eugen (host of Villas Tuparaiso) and his lovely wife Rita graciously hosted the Superbowl in their bedroom – the only place in Barra de Potosi where the boys could watch the game. Now, this is my size pool – as much as I hated to miss the Superbowl game …. I managed to console myself by floating around on the air mattress. 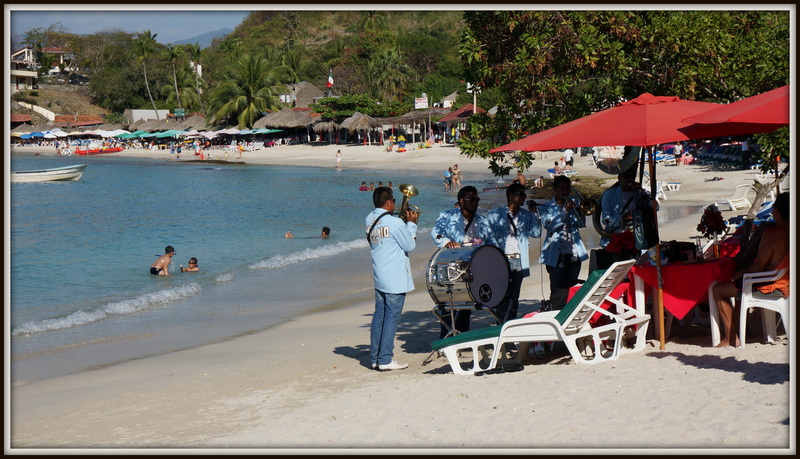 Every beach you go to in Mexico will have musicians entertaining the locals at the palapa restaurants. Hasta la vista la playa …. we are leaving Zihuatenajo area and heading back to Mexico City for our final couple of days. 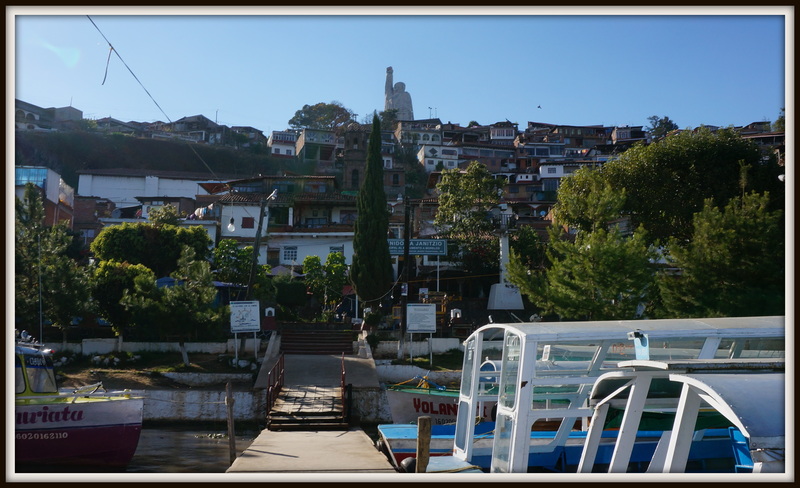 What a lovely little Colonial town, smack dab in the midst of Purepecha country. All the buildings around the centre of town are white and red, and so beautifully maintained. Naturally, churches and squares everywhere, and the markets are amazing. You never know what is behind a doorway in Mexico. 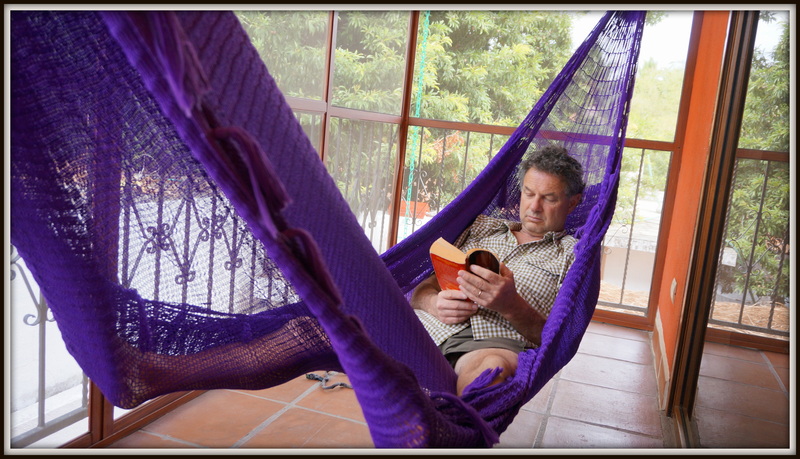 In this instance, our welcoming and comfortable casa was perfect. How could you not love stepping into a front entry like this? 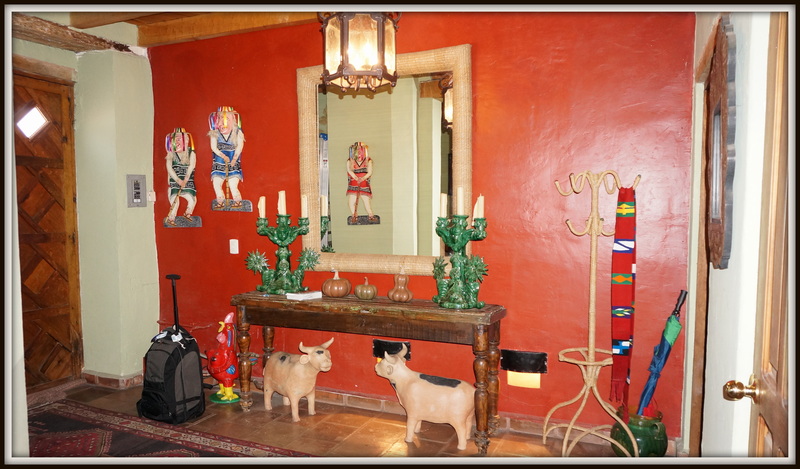 We were fortunate to find an AirBNB place to stay, Casa Nana de Ree – and it is a beautiful place. Shared kitchen and common rooms, but 3 separate bedrooms to stay in. We chose the blue room, with a private bath. 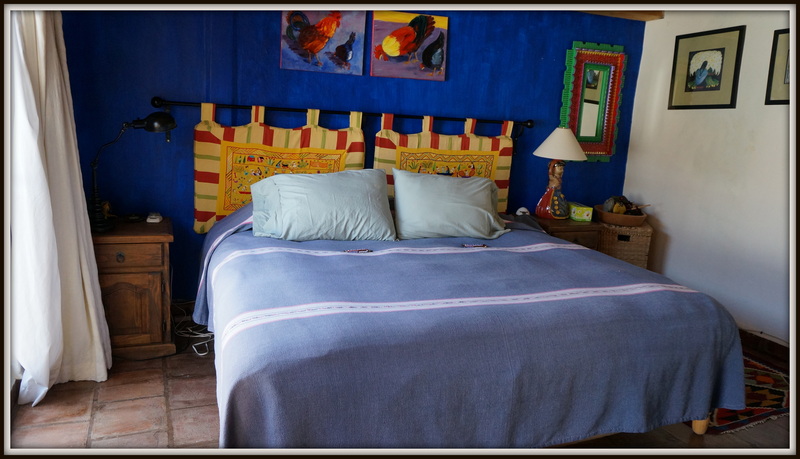 Our blue room at Casa de Nana Ree – king size bed and private bathroom. 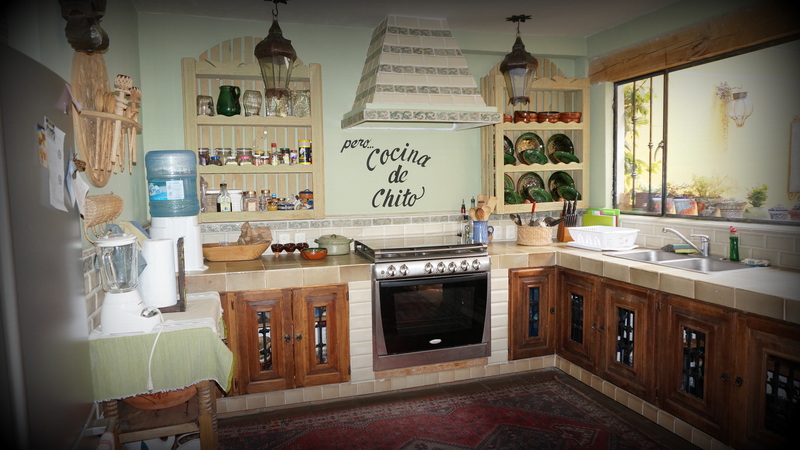 Kitchen area – way nicer than my home kitchen. For the most part, we had the house to ourselves, for 2 nights another couple were here from San Miguel de Allende, but they were out a lot. So nice to have space, be able to make a cup of tea or even dinner a couple of nights. After spending less than 100 pesos in the market, and 80 pesos for a roasted chicken, we had enough for 2 dinners and 3 breakfasts. 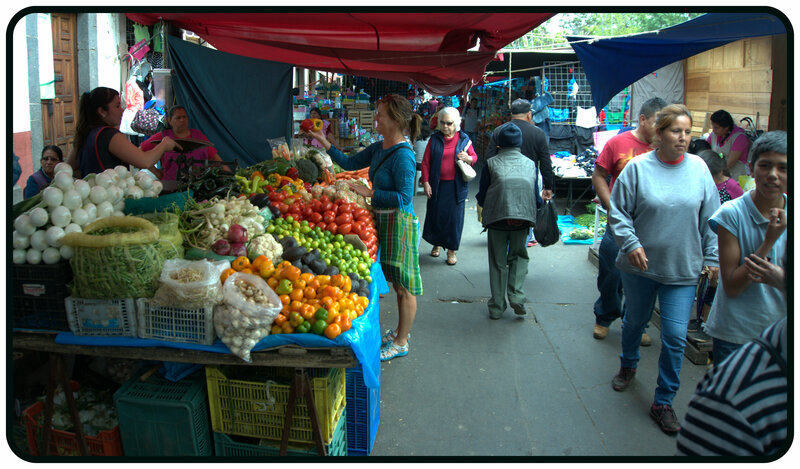 It’s pretty hard to only buy as much as you need at the mercado – all the produce is so fresh and inviting. Love having a kitchen to use. 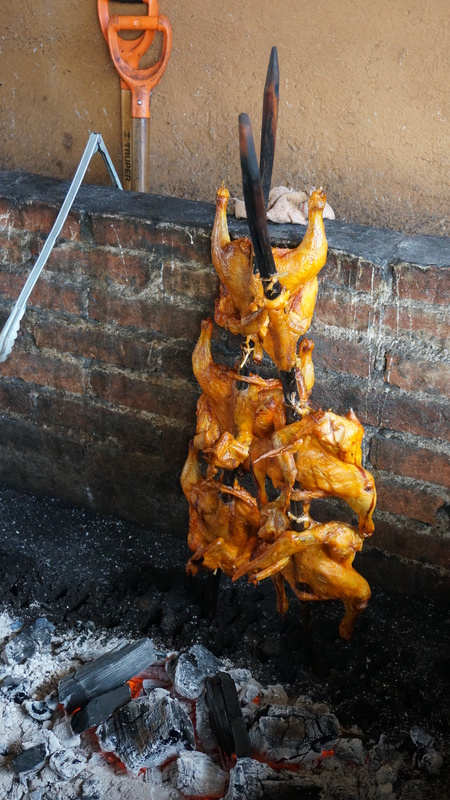 These chickens can be found everywhere – large pit with a fire in the centre and chicken on a stick, or goat on a stick, or even chorizo. Just delicious. They chop it up, put it in a container, squeeze lime and orange juice over and for 80 pesos they also throw in some orange habanero salsa. Fabulous. You never know what is behind a doorway in Mexico. 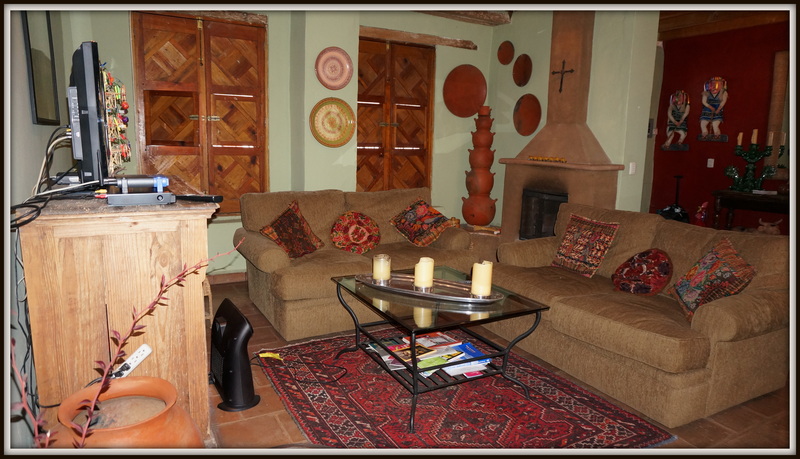 In this instance, our welcoming and comfortable casa was perfect! After a day of hiking, sight seeing or just being a tourist, it is pretty nice to be able to relax on these couches. 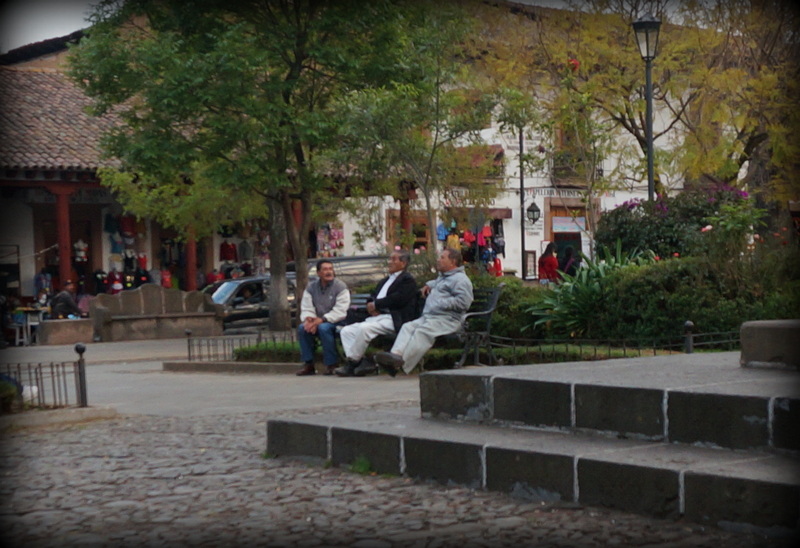 I’m not sure why but Patzcuaro had more old men sitting chatting in the plaza than any other place we’ve been – they were everywhere. Socializing and usually laughing. 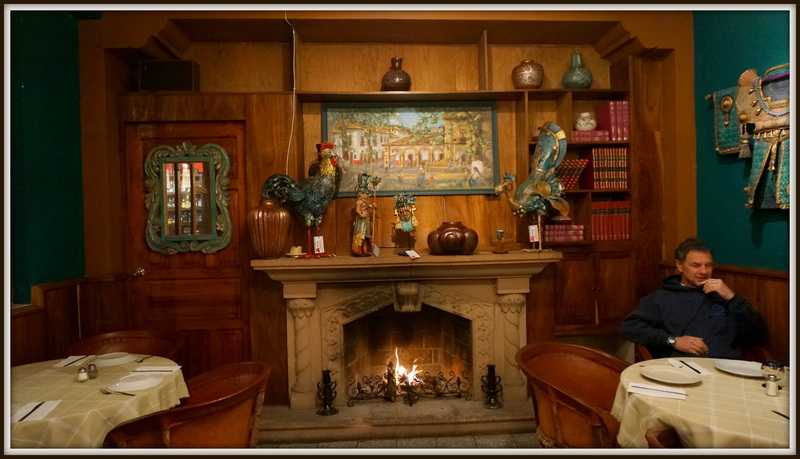 We enjoyed Lupitas a couple of times in Patzcuaro – either for a meal or just a drink in this cozy bar. Outside most of the cathedrals you will find a stall like this one, selling homeopathic remedies. 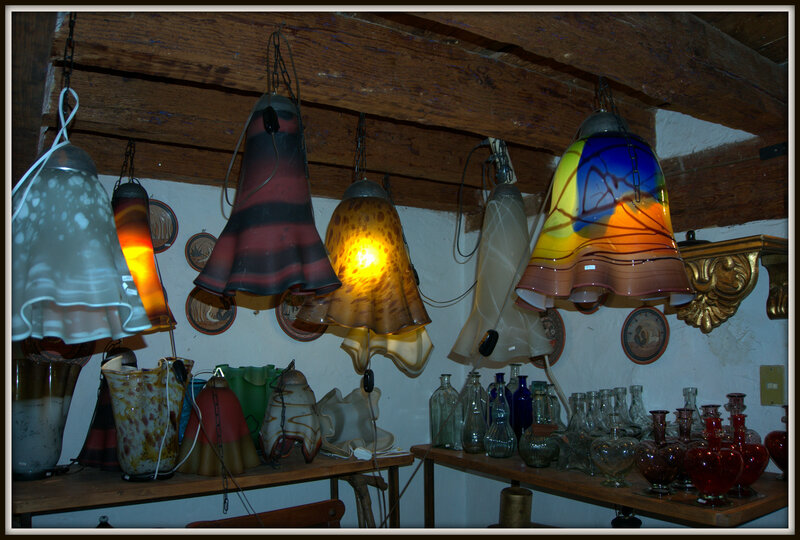 Patzcuaro is well known for their handicrafts -these beautiful lights are just one example of the amazing art to be found. 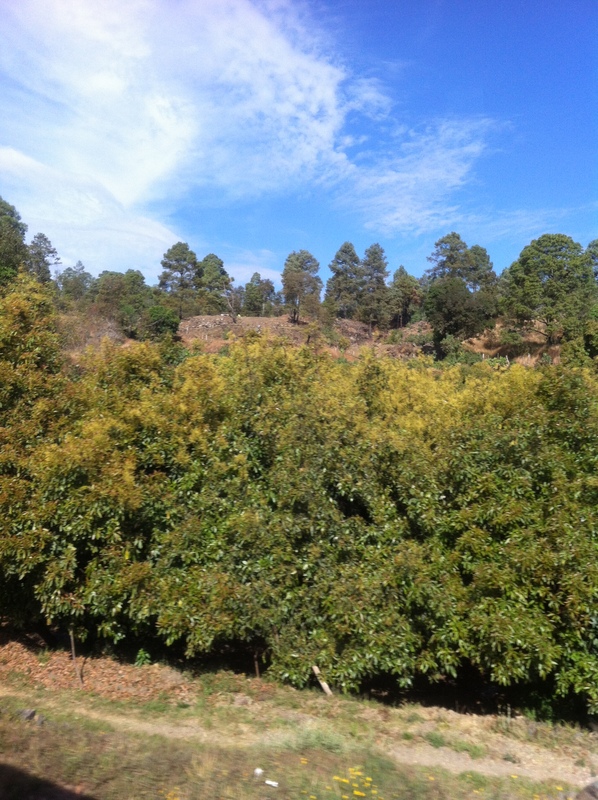 All around Uruapan, and the entire way on the highway from Uruapan to Patzcuaro are avocado trees, as far as you can see. So interesting to them alongside pine trees. 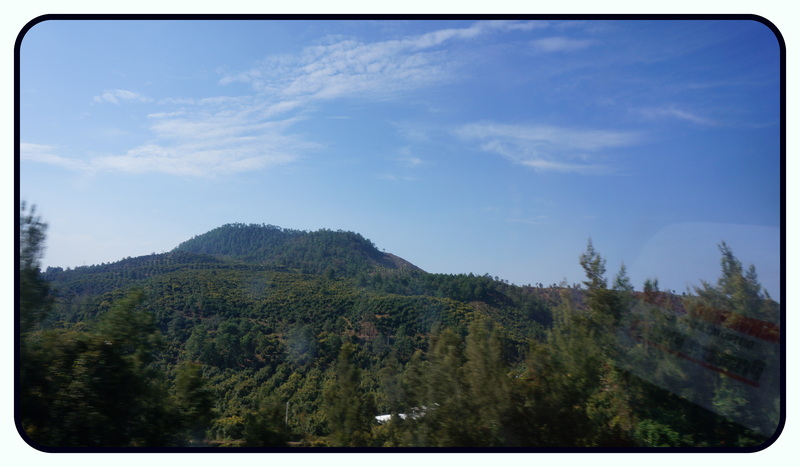 These photos were taken from the bus window, and hardly do the avocado groves (orchards?) justice. 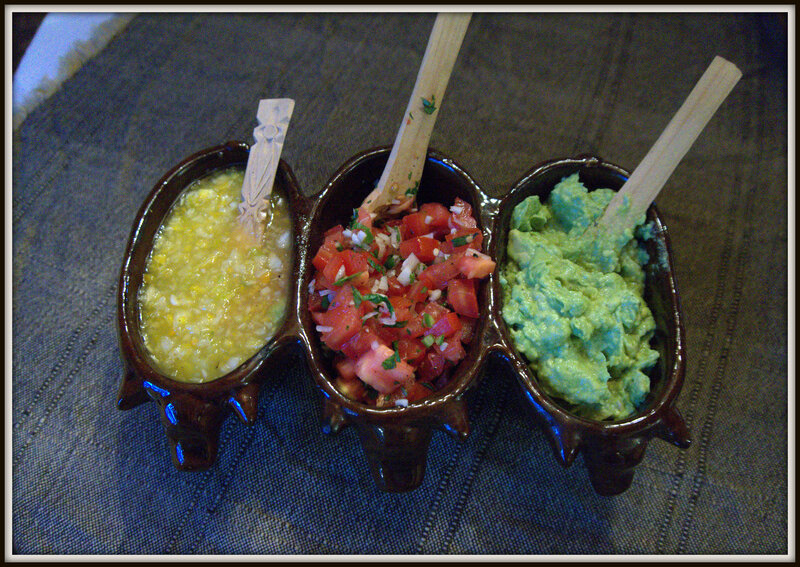 Being able to make your own guacamole and salsa at the end of a day and just sit with your feet up is so relaxing. 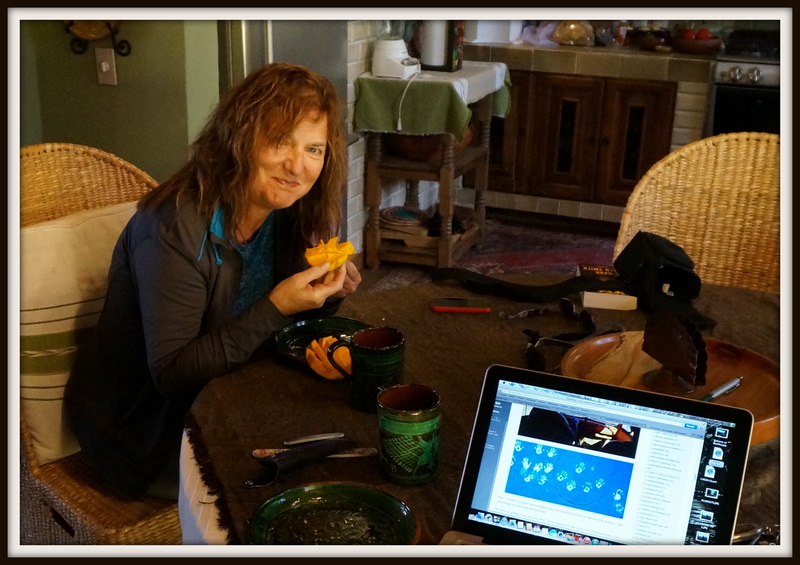 Perfect breakfast, fresh mangoes and avocado on toast with coffee. 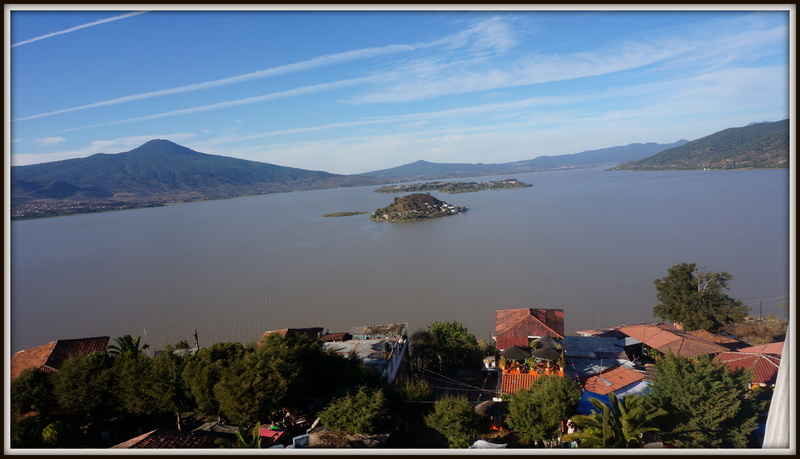 Patzcuaro has been a great place to use as a base for seeing so much in the area, Quiroga, Tzintzuntzan, Isla Janitzia, Morelia and more. However, the beach is calling our (my?) names so we are off for a night in Uruapan again (mainly to check out a restaurant we have heard about in yet another small town with a big name). Then, it is back to the beach area …..somewhere. Speaking of food ….. and aren’t I usually speaking of food?? 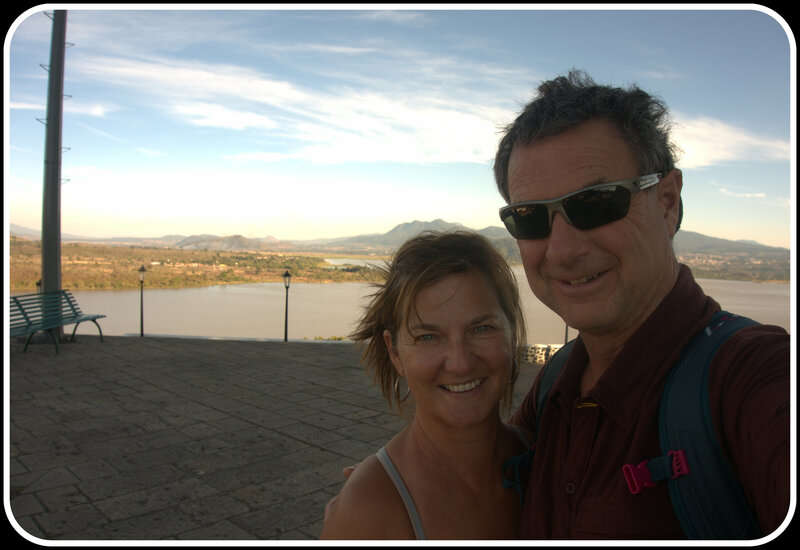 We are enjoying Patzcuaro so much we decided to just stay here and do a day trip to Morelia instead of going there for a couple of days. That involved hopping onto a bus and off we went. Michoacan, and in particular the Morelia area, can be an area of unrest. Often you will see protests, barricades and generally a lot of police. As we were on the bus to Morelia, we saw many trucks of heavily armed police moving very quickly towards Morelia – complete with machine guns mounted on top of the trucks, and police ready to fire. I had a few moments of feeling rather nervous, thinking to myself …. 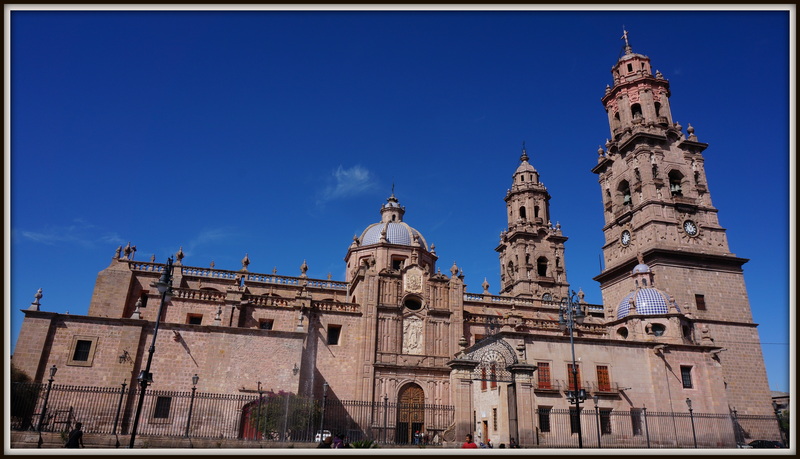 “what the heck are we doing going to Morelia?”…. 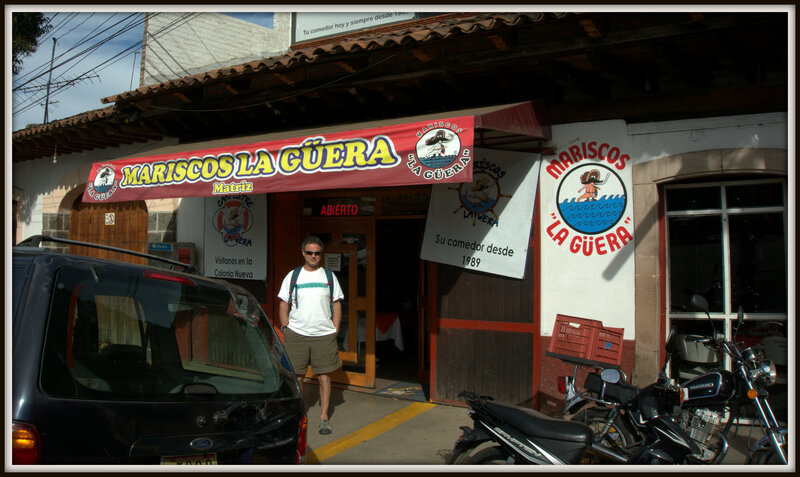 As we pulled into Morelia we noticed immediately what the panic was …………barbacoa!! Or, barbecue. All the trucks were lined up at their favourite barbecue joint and they were having a great time. Whew. 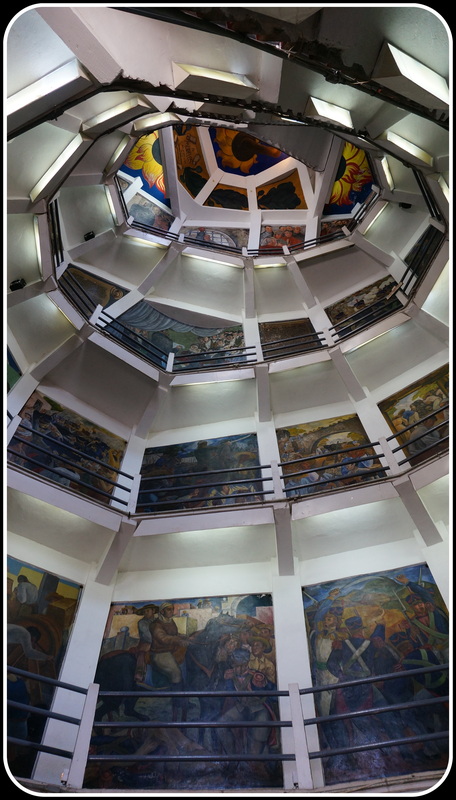 Exiting the bus, we hopped on to a taxi and went to the main zocalo – always the centre in a Mexican city. And, this is a city. Huge, and major congestion in traffic. We were told that we must try gazpacho, Morelia style. 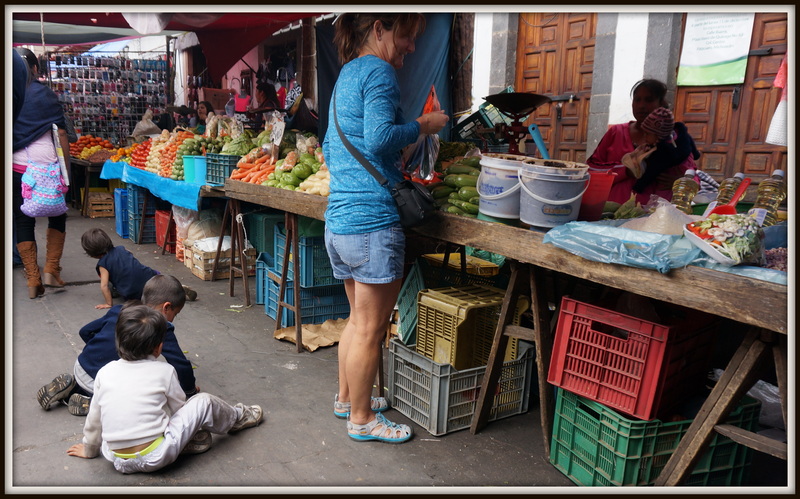 Given the instructions to find the market where the best can be found, we set off and walked from the main plaza. And walked, and walked. Eventually we did find the market. Grant is the one that spotted the gazpacho stands, and thankfully he did because I was looking for cold tomato soup, and that is definitely not what this gazpacho is. So incredibly delicious – in some ways it had the entire balance of Thai food – sweet, salty, spicy and tangy. We couldn’t believe how good it was! 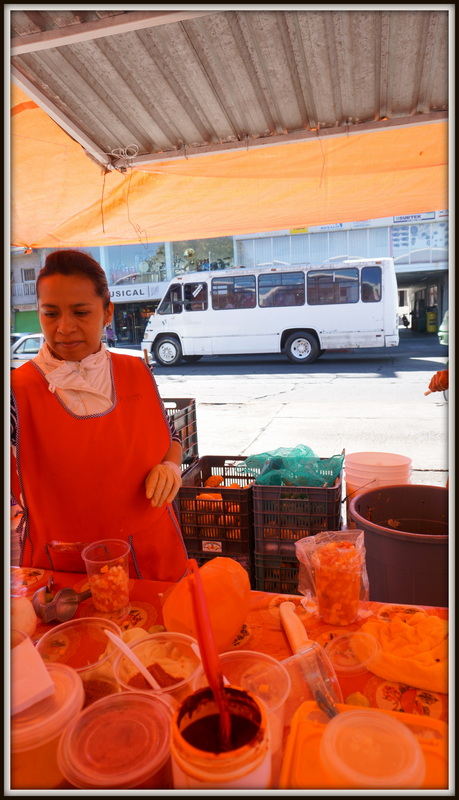 Gazpacho stand at the market in Morelia – fruit minced finely, dusted with chiles, orange and cheese traditionally. 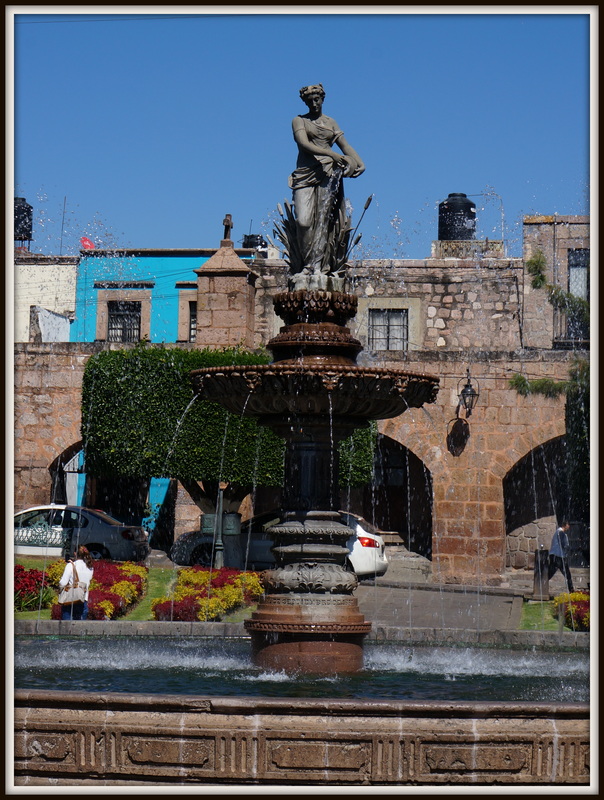 Strangely enough, in Morelia this famous statue went missing in 1940, and while they never did find out who stole it, the statue itself was replaced. 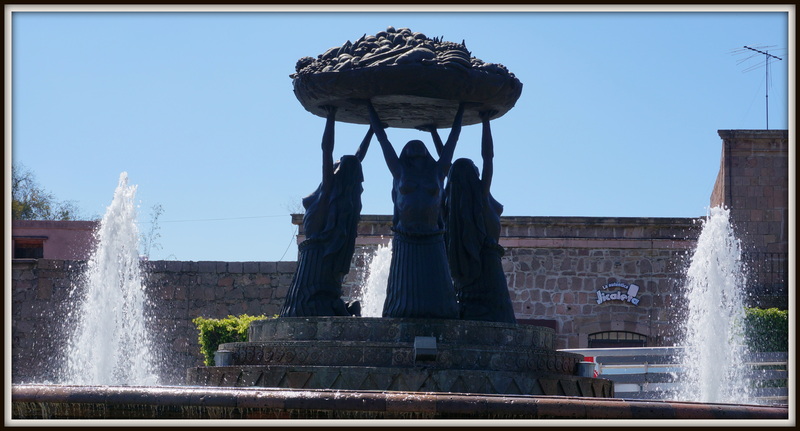 Fuente Las Taracas: This statue, of Tarascan women, holding a basket of fruit is iconic for the Morelian people. It was replaced in the 60’s after mysteriously disappearing in 1940. In Mexico, always a statue! Our next stop, strangely enough, was to eat. Hotel Casino’s Restaurant Lu was heartily recommended, along with their tasting menu. Sadly, the tasting menu wasn’t available, and the waiter wasn’t sure when it would be, so we had some of the other regions specialties – equally delicious I’m sure. Restaurant Lu, and delicious macadamia crusted trout. 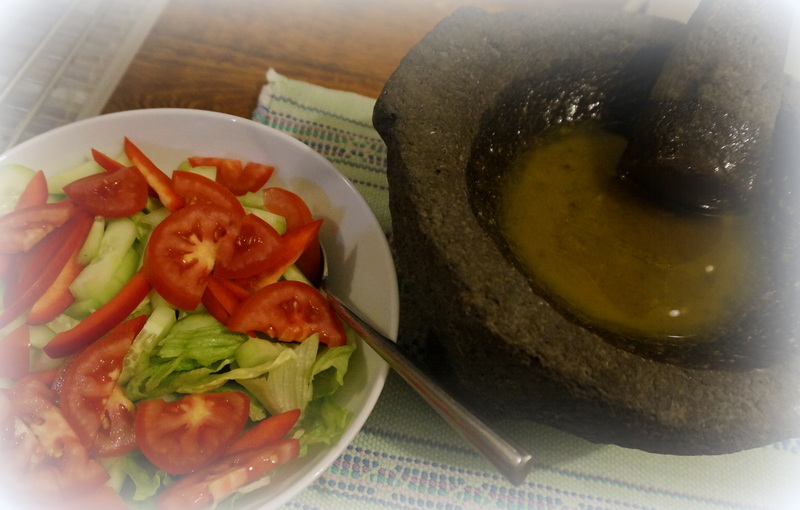 That salad was the best I’ve ever had in Mexico – topped with sugar dusted crunchy jamaica flowers! On our way back we decided to go over to Isla Janitzia. This place is a real meca in all of Mexico for Day of the Dead ceremonies. 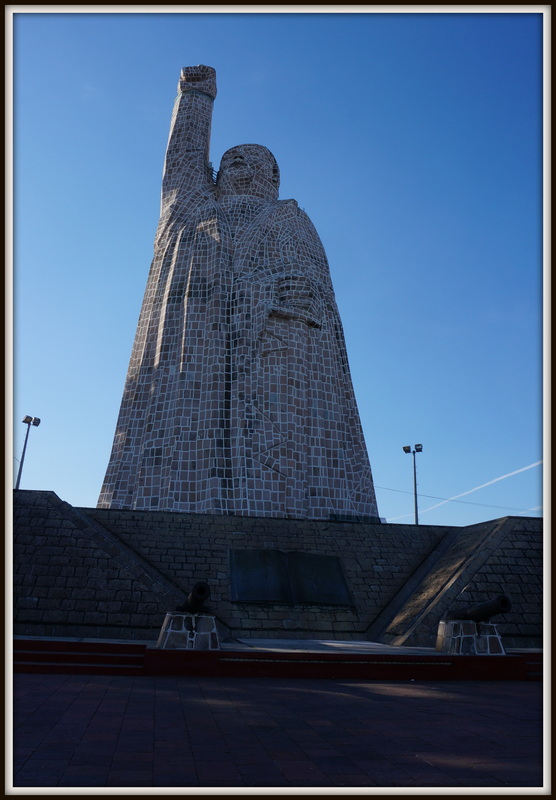 A massive statue dominates the island, with his fist held high you can see it for miles. 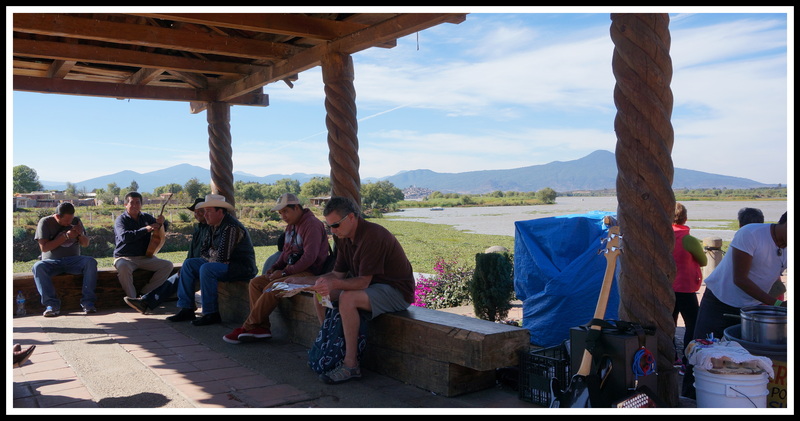 Waiting for the ferry boat to go over to Isla Janitzia, with local musicians. 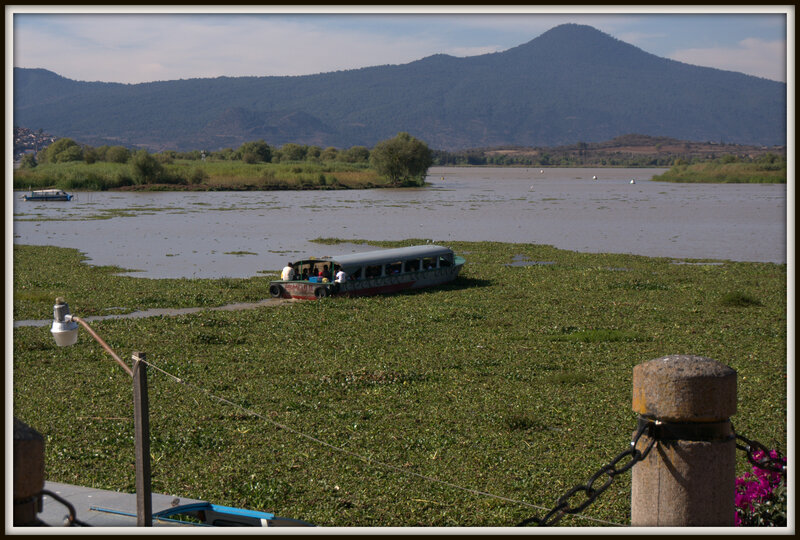 So many water plants choke the shores these boats struggle getting through. Wow. He looks bigger up close – are we really going to climb up inside him? Starting the long climb up the island. 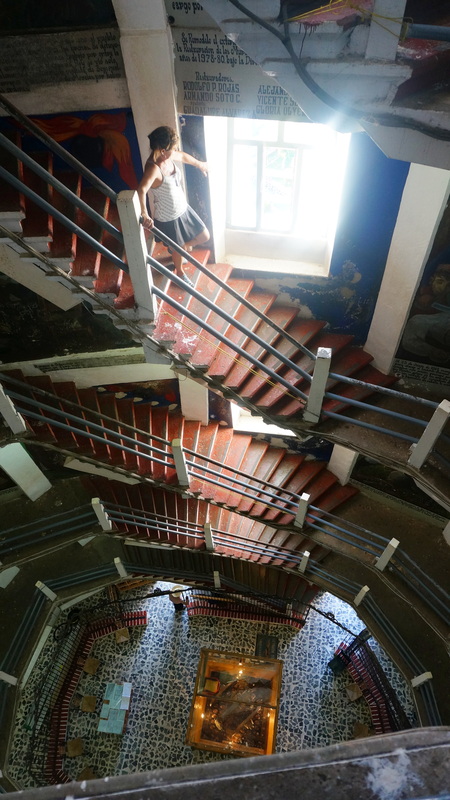 We are really going all the way up there (this is INSIDE the statue)! 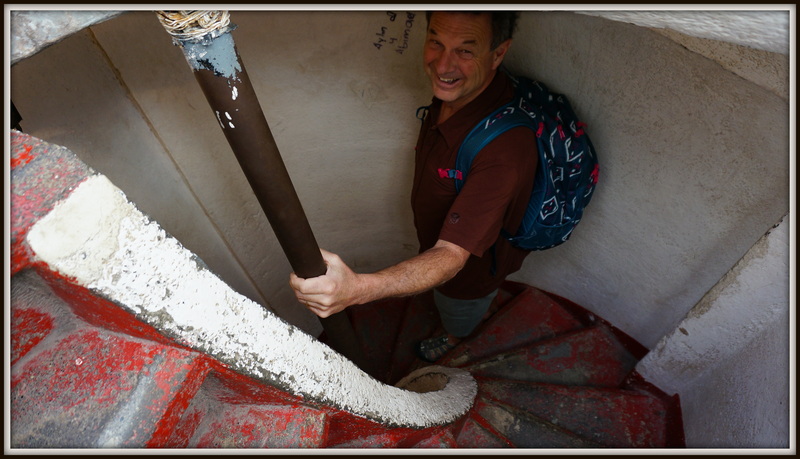 As we got closer to the top of the statue, inside his arm, it got closer and closer and tighter and tighter and twistier…. Yes, I was literally clinging to the wall and the railing on the way down. Why is going down always so much worse than going up? For me it certainly is. I seriously wasn’t sure if my wobbly knees were going to collapse, I was going to tinkle, or I was going to cry. 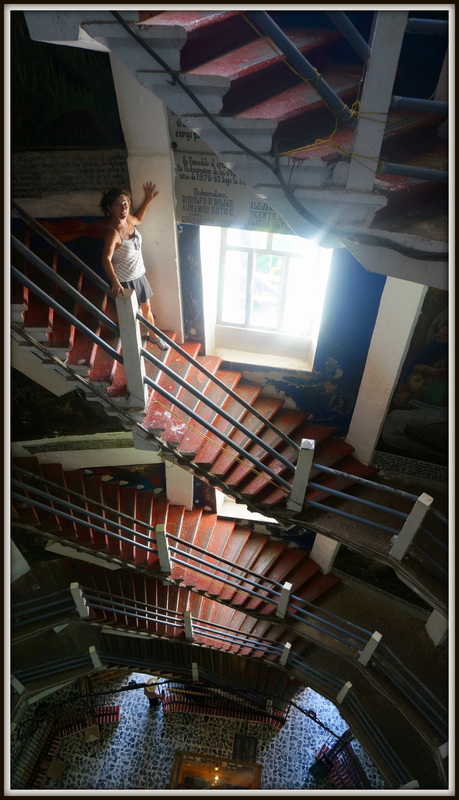 General rule of thumb, if you climb up those steps, you will have to go back down there. Basketball court on Isla Janitzia – maybe 20 feet x 20 feet, but not really square, and a LONG way down to the water if you lose the ball! After all that traipsing around and eating, we were happy to stay at our Casa and have chicken soup from a previous night’s leftovers. Amazing what you can do with limited supplies!